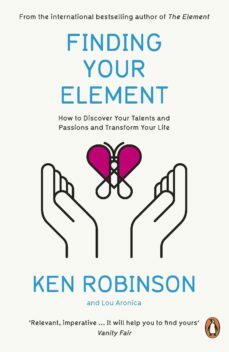 Ken Robinson, author of the international bestseller The Element and the most viewed talk on TED.com, offers a practical guide to discovering your passions and natural aptitudes, and finding the point at which the two meet: Finding Your Element.Through a range of stories from his own experience and those of people from all walks of life, Ken Robinson explores the diversity of intelligence and the power of imagination and creativity. For some, finding their element has brought fame and success, like Ellen McArthurs unusual journey from growing up in a landlocked ex-mining town to achieving sailing glory. However many of the inspiring stories are of ordinary people who read the first book and were moved to share how its principles have transformed their lives, like the man who found fulfilment as a magician after years of working as a computer engineer. This book also provides the tools, techniques, resources and advice you need to discover the depth of your abilities and identify opportunities for change. It looks at the conditions that enable you to find yourself: why its so important to connect with people who share your element and why your attitudes may be holding you back.Finding Your Element shows that age and occupation are no barriers to discovering what makes us happiest, and that once we have found our path we can help others to do so as well.Sir Ken Robinson, Ph.D, is an internationally recognized leader in the development of creativity, innovation, and human potential. He advises governments, corporations, education systems, and some of the worlds leading cultural organizations. His 2008 talk on how schools kill creativity is still the most watched video on TED.com with over 13.5 million views to date.Lou Aronica is the author of two novels and coauthor of several works of nonfiction, including The Culture Code (with Clotaire Rapaille) and The Element.